Prime Minister Narendra Modi reached Puducherry on Sunday, 25 February, to participate in the golden jubilee celebrations of the Auroville International Township in Aurovillie. The PM was received at the airport after he arrived at around 10.30 am by Puducherry Lieutenant Governor Kiran Bedi and Chief Minister V Narayanasamy in the Union Territory located 170 kilometres south of Chennai. From the airport, the PM went straight to the Sri Aurobindo Ashram where he paid his respects to spiritual leader Sri Aurobindo, the founder of the ashram. This is the PM’s first visit to the UT after becoming the Prime Minister in 2014. Narayanasamy had reportedly stated earlier that he wishes to discuss with the PM, the Centre’s assistance plan for development works in Puducherry and pending funds from the Centre. According to reports, the government is expecting that the Centre will release the funds especially after Union Minister of State in the Ministry of Finance and Ministry of Shipping, Pon Radhakrishnan, said that the PM’s visit will bring with it development of the Union Territory. 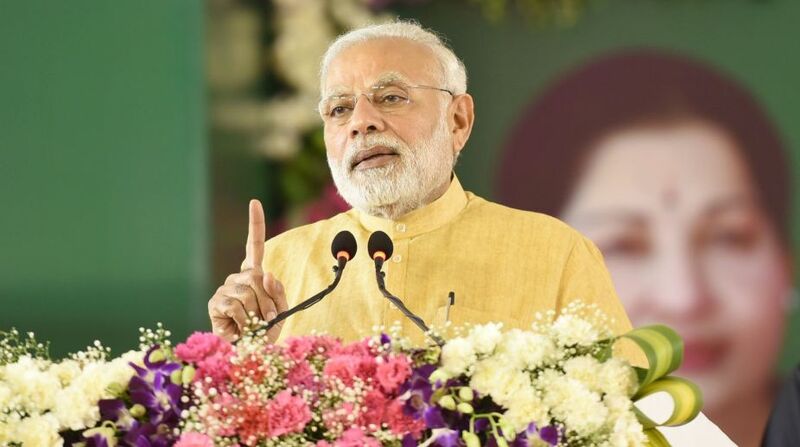 At Puducherry, the PM will visit the Sri Aurobindo International School of Education before heading to the 50-year celebrations in the former French colony. He will also reportedly address a public meeting organised by BJP’s local unit. PM Modi was earlier scheduled to arrive in Puducherry on 24 February. The international or universal project envisioned by the Mother of Aurobindo Ashram (Mirra Alfassa) is dedicated to the ideal of human unity. On Saturday the PM launched the AIADMK government’s ‘Amma’ scooter subsidy scheme to provide subsidised two-wheelers to working women on the 70th birth anniversary of late Tamil Nadu chief minister J Jayalalithaa. From Puducherry, the PM will head to Surat, Gujarat, to flag off the ‘Run for New India Marathon’.